Part of the power of mobile technology is that activity can occur anywhere; in transit, at a sports game, at work and at home. We are no longer tethered by place to the internet. To what degree are people taking advantage of this? 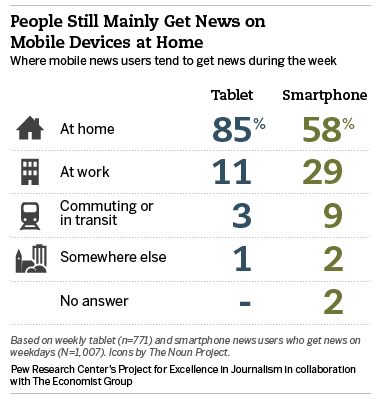 When it comes to news at least, home still dominates. On tablets, fully 85% of news users say they tend to be at home when they get news on their tablet during the week (and even more, 92%, tend to be home during the weekend). Just 11% during the week are at work when they get news, and a mere 4% say they get news when they are on the go. Some of that may have to do with the fact that most tablets do not come with cellular connectivity (it is usually optional) and therefore require Wi-Fi , which is commonly available at home and work but less so in places in between. Yet the data show that even for people who don’t have that limitation, home is still the dominant place for tablet news consumption. Those who have a data plan are just as likely as those who do not to consume news on their tablet while at home. The findings for smartphone news consumption are similar. Even though most smartphones can give you internet access anywhere, just 9% say they tend to get news on it during the week while they are commuting. Far more tend to be at home (59%) or at work (28%) when they use their smartphone for news. In short, while mobile technology allows people to get news on the go, relatively few people do so. The lure of home as a place for news consumption is also linked to the findings about when people get their news. Even though mobile devices make it easier to get news whenever you want, mobile device owners still seem to have habitual times of day when they consume news. 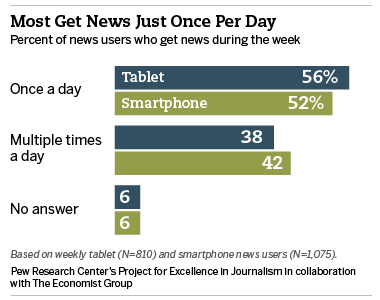 And for about half of mobile news users on each device, it is just a single time each day. These numbers may not fully capture whether news is becoming an ongoing activity. Many people also continue to get news on other platforms (print, TV, radio and computer) at other times of day in addition to the news they get on their mobile devices. But the idea that people are turning to the news continually on their mobile devices has not emerged, at least not yet. The majority of tablet news consumers, 56%, say they usually consume news on the device just one time a day on weekdays; 38% do so multiple times a day. The pattern is nearly identical for news consumption on the weekends (55% once a day vs. 34% multiple times). Even smartphone news consumers are more likely to check in with the news just one time a day, even though they likely have their phones in their pocket much of the time. During the week, 52% of smartphone news users said they get news on that device just one time a day while 42% do so multiple times. And on the weekends, frequent news consumption is even less common; 52% get news once a day and 32% do so multiple times.